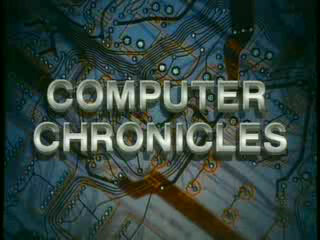 The Computer Chronicles was a US television series, broadcast during 1981-2002, which documented the rise of the personal computer from its infancy to the immense market at the turn of the century. The series was created in the Fall of 1981, by Stewart Cheifet (later co-host), then the station manager of the College of San Mateo’s KCSM-TV, initially broadcast as a local weekly series. Jim Warren was its founding host for its 1981-1982 season. It aired continuously from 1981 to 2002 with Cheifet co-hosting most of its later seasons. Gary Kildall served as co-host for six years (1983 to 1990) providing insights and commentary on products as well as discussions on the future of the ever-expanding personal computer sphere.